After a cloudy start to the morning, the skies cleared to give us a gorgeously sunny trip out on our smaller tour vessel, Whale Whisperer. We had a quiet start to our trip and as we cruised by the shallows in search of Humpback Dolphins unfortunately none were to be found. 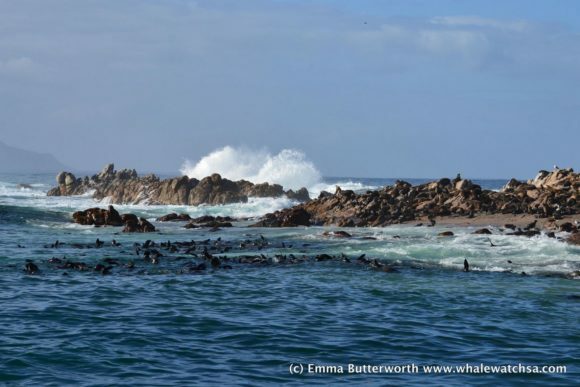 So after passing through the Shallows we headed out to open water in search of whales. The ride out was exhilarating and the huge waves were perfect for keeping everyone on their toes. 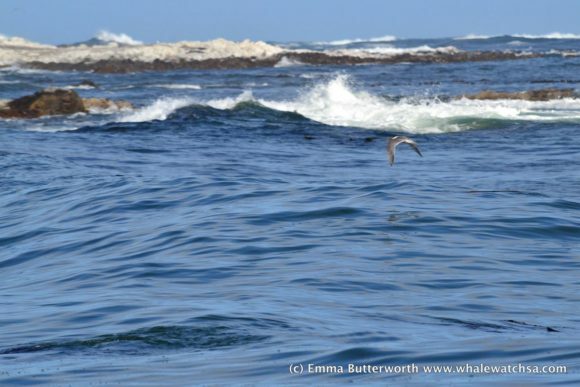 Albeit no whales to be seen even with plenty of keen eyes on the look out, we did come across a beautiful Shy Albatross, gracefully gliding over the ocean. 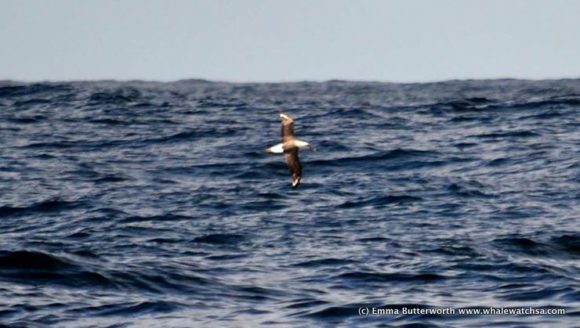 This huge bird has a wingspan of 2.1-2.6m and they often follow trawlers. With no luck further out to sea we took to Dyer Island and Geyser Rock to see the colony of seals and hopefully some penguins. 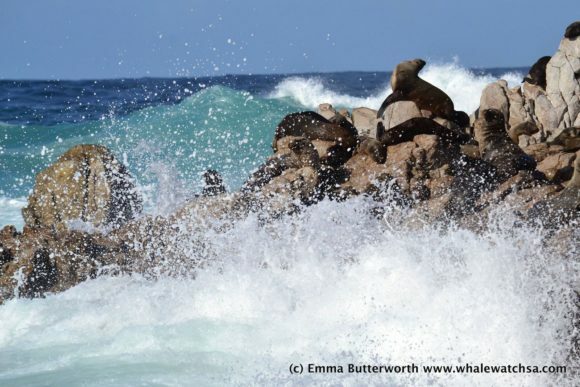 On arrival, the 60,000 strong colony of Cape Fur Seals were lounging on Geyser Rock or chilling out in the water surrounding it. 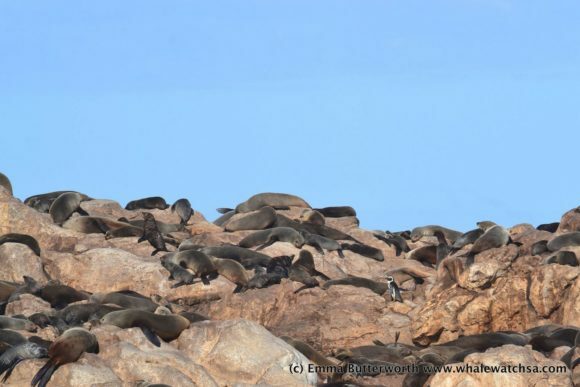 Curiously, there was also an African Penguin in amongst the seals. Perhaps it was lost or just wanted to be a seal. 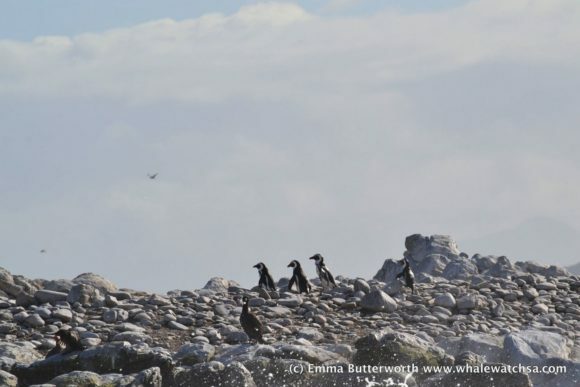 We took a quick stop a bit closer to Dyer Island and seeing a “waddle” of 4 penguins returning from hunting at sea. 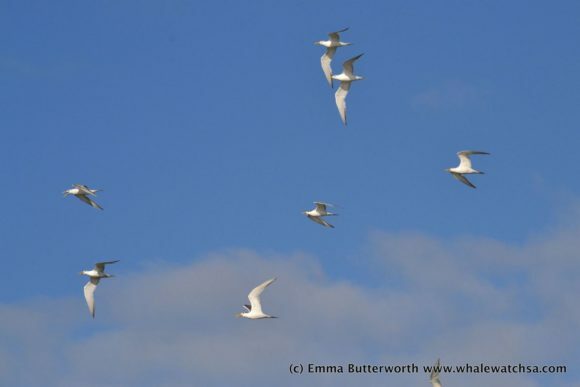 After watching some amazing aerial acrobatics from the Swift Terns, we began to head back to the harbour to end out trip. However this wasn’t the end! 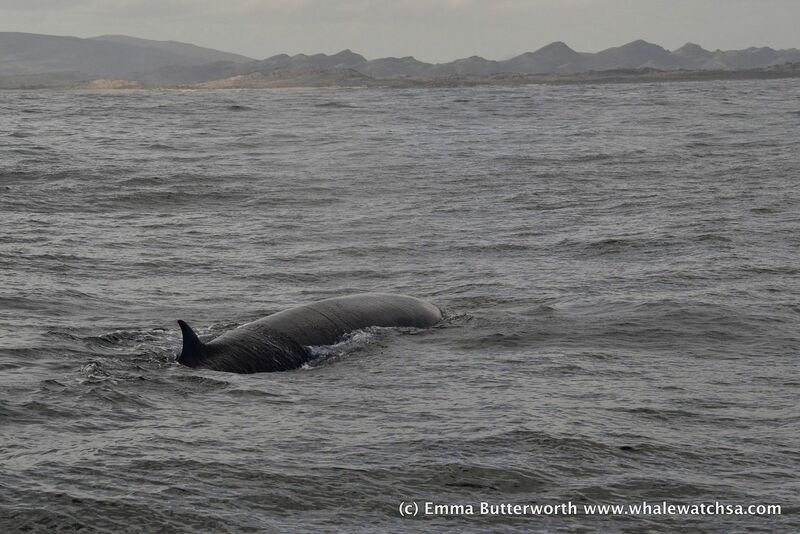 Partway back, we suddenly changed our course and it was full speed ahead… A whale had been spotted! This was a Bryde’s Whale, a usually shy and elusive whale of which you see the top of their head and their dorsal fins only before they dive and are gone. However this individual was rather unique in that it was almost playing with the boat! It surfaced right next to us multiple times, swimming underneath the boat and zig-zagging either side us. The most amazing moment was when it swam underneath the boat and turned upside down just next to us, looking at the boat. This is incredibly unusual as this species tends to keep its distance from the boats, what a treat!!! After spending some time with this whale, we departed for the harbour and the end of the tour. This was an incredible trip as the behaviour of that whale was definitely something rarely witnessed!